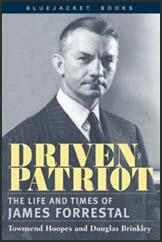 James Vincent Forrestal, the son of an Irish immigrant, was born in Matteawan, New York on 15th February 1892. After attending local schools he joined the Matteawan Journal at the age of sixteen. He also worked as a reporter on the Mount Vernon Argus before becoming city editor on the Poughkeepsie News Press. Aware that progress would be slow without a college education, in 1912 he went to Princeton University. Three years later Forrestal left Princeton without getting a degree and went to work for the New York World. In 1916 Forrestal joined the banking firm Dillon, Read & Company as a bond salesman in New York. The following year he moved to Canada where he joined the Royal Flying Corps. By 1918 he qualified as a pilot but did not see active service in the First World War. After the war Forrestal returned to Dillon, Read & Company. Progress was rapid. He was appointed head of the New York office's sales department and in 1923 was a partner in the firm. Three years later he became vice-president and in 1938, when he was forty-six years old, he became its president. In 1940 Franklin D. Roosevelt appointed Forrestal as one of his advisers. His duties included working as a liaison officer between the president, the Treasury Department and other governmental financial agencies. Roosevelt was impressed with Forrestal and in August 1940 he was appointed under secretary of the navy with special responsibility for procurement and production. In 1941 Forrestal went to London to negotiate the Lend-Lease agreement. When William Knox died on 23rd April 1944, Forrestal became the new Secretary of the Navy. In this post he visited the Pacific three times and Europe twice and watched the D-Day landings in June, 1944. Forrestal held the post until September 1947 when he became Secretary of Defence. After the war Forrestal became associated with the campaign against communism. This upset liberals in Washington who still believed it was possible to develop good relations with Joseph Stalin and the Soviet Union. In September 1946 he joined with James F. Byrnes to get Henry Wallace sacked after he made a speech calling for an end to the Cold War. In 1948 the journalist Drew Pearson revealed in his newspaper column that during the 1930s Forrestal had been guilty of tax evasion and share manipulation. Other journalists made claims that Forrestal had owned shares in large companies in Nazi Germany and had used his influence to stop the bombing of German cities during the Second World War. Harry S. Truman was unhappy with Forrestal's performance as Secretary of Defence and on 28th March 1949 forced him to resign from office. Soon afterwards, Forrestal, suffering from depression, was admitted to Bethesda Hospital. On 22nd May 1949 James Forrestal committed suicide by throwing himself out of a 16th-floor hospital window. 1. The present danger which this country faces is at least as great as the danger which we faced during the war with Germany and Japan. Briefly stated, it is the very real danger that this country, as we know it, may cease to exist. 2. From 1941 to 1945 we won a war by enlisting the whole-hearted support of all our people and all our resources. Today we are losing a comparable struggle without ever having enlisted the strength of our people and our resources - and the consequences of our loss will be the same consequences that would have followed if we had lost the war of 1941-45. 3. Of the strategic battlegrounds of the present struggle, we have already lost Poland, Yugoslavia, Romania, Bulgaria, and a number of others; Greece is in imminent peril; after Greece, France and Italy may follow; and after France and Italy, Great Britain, South America, and ourselves. 4. We lost strategic battlegrounds in the war of 1941-1945, also-but even while we were losing some battlegrounds, we were planning the offensives by which we were to win the ultimate victory. And we won the victory by pressing home our attacks - by landing our troops at Guadalcanal, North Africa, Guam, Iwo Jima, Normandy, the Philippines, and a host of other places. 5. This country cannot afford the deceptive luxury of waging defensive warfare. As in the war of 1941-45, our victory and our survival depend on how and where we attack. 6. By providing outstanding economic leadership, this country can wage its attack successfully - and can thereby build the foundations of a peaceful world. For the only way in which a durable peace can be created is by world-wide restoration of economic activity and international trade. 7. In order to be successful, our product-our economic leadership-will have to prove its superiority to the commodity which Russia has lately been so successful in peddling. Russia has a product which is skillfully tailored to appeal to people who are in despair-and thanks to German and Japanese aggression, Russia has had a wealth of customers who are sufficiently desperate to turn to anything. Moreover, the accomplishment of Russia's aims has been greatly simplified by the fact that we have heretofore offered the world no practical antidote for the Russian poison. 8. What we must do is create the conditions under which a free world society can live. With that as our object, a group of our most competent citizens should be called together in order to enlist the full support of all elements of our economy in the accomplishment of this basic American task. For only by an all-out effort on a worldwide basis can we pass over from the defense to the attack. In making our all-out effort, we will be forwarding not only world stability but also our national interest-which includes, of course, business interest, labor interest, and public interest. (a) Japanese assets amounting to some $137,000,000 are presently impounded. If these assets were set up as a revolving fund with which Japan could import raw materials for its industries, Japanese exports could again enter the channels of world trade-and Japanese workers would have employment and something to eat. (b) A similar revolving fund could be set up for Germany, for a durable peace can rest only upon a Germany that, while militarily impotent, is industrially active. 10. The group referred to above should be called together promptly. It should consist of our best brains-from, management, from labor, from both the executive and the legislative side of the government, from any source that has a contribution to make-for the issues to be faced are crucial, and we must attack if we are to survive. (2) Drew Pearson, comments made to Jack Anderson in 1948.
a man who lives only for himself. He has broken his word, turned his back on his friends. He is driven by one ambition; he has always craved to be top man - first of Wall Street and now of the United States. Any principles he has are the kind that will cause another world war - unless he's stopped first. I began to inquire quietly into the reasons behind Drew's antipathy (towards James Forrestal) and found they had been accumulating for twenty years. To begin with, Drew held Forrestal accountable for the record of Dillon, Read & Co. during the period he had been a dominant force there. It was a record which sinned flagrantly against Drew's brightest passions and darkest prejudices - his lifelong crusade to free Latin America from U.S. exploitation, his championship of a homeland for the world's displaced Jews, his loathing of Big Oil and his fundamental distrust of the German nation, under whatever regime. In the 1920's Dillon, Read & Co. had loaned $20 million to Bolivia, which was used to finance an aggressive war against Paraguay; it loaned hundreds of millions to the German cartels of the Ruhr during the pre-Hitler period, reviving industries which were to form the backbone of Hitler's war machine. When Forrestal, as the strong man of the Truman Cabinet, pushed for yet another restoration of the Ruhr industries and planned a lend-lease program of arms to "friendly" Latin American military regimes. Drew foresaw a magnification of the follies and tragedies of the past. At Dillon, Read & Co., Forrestal had been banker to Big Oil and had helped underwrite its expansion into the Arab countries; and when, during World War II, our Navy grossly overpaid the Arabian-American Oil Company for petroleum, or when Forrestal vehemently opposed the partition of Palestine and persuaded President Truman to reverse his initial support for a new Jewish state, Drew saw the hated hand of the international oil puppeteers at work. There were respectable national-interest arguments to be made for the Dillon, Read loans and the Forrestal public policies, but they ran afoul both of Drew's idealism and his demonology. This country and its government are desperately anxious to avoid war. It is simply a question of how best to do it. If all Europe lies flat while the Russian mob tramps over it, we will then be faced with a war under difficult circumstances, and with a very good chance of losing it. Our effort now is to try to make the Russians see the folly of continuing an aggression which will lead to war, or, if it is impossible to restore them to sanity, that we at least have a start which will enable us to prevent our being caught flat-tooted as we were in 1941. Secretary of Defense Forrestal still favors his plan of sending more arms to Latin America under a new lend-lease agreement, despite the fact that new arms to Latin American generals are like a toy train to a small boy at Christmastime. They can't wait to use them - usually against their own President. General Somoza, the Nicaraguan who has now inspired the fracas in Costa Rica, was trained by the US Marines, later seized the Presidency of Nicaragua. President Trujillo, worst dictator in all Latin America, was also trained by the US Marines. Unfortunately, under the Forrestal-Marine Corps program, we train men to shoot and give them the weapons to shoot with. But we don't give them any ideas or ideals as to what they should shoot for. Back in the 1920's, Secretary Forrestal's Wall Street firm loaned 20 million dollars to Bolivia, used to buy arms to wage war against Paraguay. Some time after Forrestal loaned this money to Bolivia, the Remington Arms Co., of which Donald Carpenter is now vice president, stepped in to profit by it. Remington got a contract for 7.65 mm. and 9 mm. cartridges. Carpenter had just joined the firm when this sale was made. So Forrestal and Carpenter, once operators in indirectly fomenting war in Latin America, are now together in running American defense. 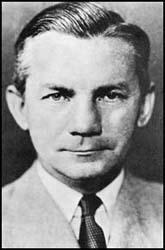 (6) In 1948 the US Secret Service began investigating James Forrestal's behaviour. Mr. Forrestal had become so overly suspicious that whenever the front door was opened or the bell rang, he would go to the area and peer out secretly to see who was there. And only the week before, Mr. Forrestal had come into the kitchen while he, the butler, was there. The Defense Secretary was wearing his hat around the house, apparently forgetting that he had it on, or that he had decided to go out. On this occasion he looked right at the butler and asked: "Where's my butler?" When the butler said, "I'm here. Sir," Mr. Forrestal looked confused and could not remember what he wanted. 8th January, 1949: Jim is looking badly. He has a conscience and a sense of duty. These, coupled with his feeling of urgency and his terrific, almost tragic, disappointment in the failures of professional men to "get together," leads him to certain errors. Among these none is worse than the way he treats himself. He gives his mind no recess, and he works hours that would kill a horse. 11th June, 1949: There is no use trying, after his death, to decide exactly what I thought of Jim Forrestal. But one thing I shall always remember. He was the one man who, in the very midst of the war, always counseled caution and alertness in dealing with the Soviets. He visited me in 1944 and in 1945 and I listened carefully to his thesis - I never had cause to doubt the accuracy of his judgments on this point. He said, "Be courteous and friendly in the effort to develop a satisfactory modus vivendi, but never believe we have changed their basic purpose, which is to destroy representative government." He insisted they hated us, which I had good reason to believe myself. I still do, but now, everybody does. Moreover, those who were then asleep now are professional patriots and Russian haters. Forrestal's general mood was one of depression and despondency. Even when he was relatively relaxed, the conviction expressed to Lovett, that "they're after me," was never entirely absent. One afternoon, for example, while walking along the beach, Forrestal pointed to a row of metal sockets fixed in the sand for holding beach umbrellas, and remarked: "We had better not discuss anything here. Those things are wired, and everything we say is being recorded." been duped by Communists and communist sympathizers, Forrestal believed that he had been chosen as their Number One target for liquidation as a consequence of his efforts to alert Americans to the communist menace. James V. Forrestal hated the Communists. He hated the thoughts of their undermining this land of ours, in which he had been able to work himself up from a poor man to one of wealth and high position. He hated the thoughts of allowing the Communists to overrun Poland, Estonia, Latvia, Lithuania, Rumania, Hungary, Bulgaria, Czechoslovakia, and China. There is every reason to believe that the dangers of communism and the manner in which so many of our citizens overlook those dangers preyed on his mind, until, finding a weak spot, the pressure caused his collapse which ended in his tragic demise. Let us pray that all of us fight as good and as long a fight as did Jim Forrestal. In the end, it may be found that Mr. Forrestal's friends had more to do with his death than his critics. For those close to him now admit privately that he had been sick for some time, suffered embarrassing lapses too painful to be mentioned here. request for his resignation undoubtedly worsened the illness. The real fact is that Jim Forrestal had a relatively good press. All one need do is examine the newspaper files to see that his press was far better than that of some of his old associates. matter how mild, because of health, then the Government of checks and balances created by the Founding Fathers is thrown out of gear. It was not criticism which caused Jim Forrestal to conclude that his life was no longer worth living. There were other factors in his life that made him unhappy. Forrestal not only had no spiritual resources, but also he had no calluses. He was unique in this respect. He was acutely sensitive. He had traveled not on the hard political path of the politician, but on the protected, cloistered avenue of the Wall Street bankers. All his life he had been surrounded by public relations men. He did not know what the lash of criticism meant. He did not understand the give-and-take of the political arena. Even in the executive branch of government, he surrounded himself with public relations men, invited newsmen to dinner, lunch, and breakfast, made a fetish of courting their favor. History unfortunately will decree that Forrestal's great reputation was synthetic. It was built on the most unstable foundation of all - the handouts of paid press agents. If Forrestal had been true to his friends, if he had made one sacrifice for a friend, if he had even gone to bat for Tom Corcoran who put him in the White House, if he had spent more time with his wife instead of courting his mistress, he would not have been so alone this morning when he went to the diet pantry of the Naval Hospital and jumped to his death. Forrestal would bring up somewhere and somehow a variant of the same theme: how this Government, which he knew was almost unmanageable, could be made to work, how men could be found who were competent to administer it, how methods and situations could be devised to make it possible for competent men to be wise. He was like a doctor who had studied a disease and then contracts it himself. He saw with an awful clarity his own mistakes and his failures so sharply that the affection of his friends could not console him, that public tributes could not deceive him. He saw them with such terrible conscientiousness and scruple, so out of proportion in the record of his achievements, that he was exhausted - not so much by the long hours he worked as by the realization that he would never have a chance to repair his mistakes and to achieve what he had been appointed to achieve. tiring public men is the most expensive. I shall always believe that if Forrestal had known before he left the Pentagon that he was really wanted somewhere else, as indeed in all justice and common sense he should have been, he would have had a reason for living, and the fatigue the doctors talk about would not have overcome his will to live. It is an interesting speculation as to what extent Forrestal's desperation was deepened by a group of ill-assorted columnists and ideological libertarians. During his whole Government service it was implied in a continuous stream of billingsgate that Forrestal was in the Government to serve his former partners in the investment-banking business, that he was a "cartelist" and a truckler to fascism. It is a little late to go into all that, but it is not too late to make the obvious comment that the responsibility for this abuse of a free press goes beyond the malice of gossip columnists and rests firmly on the heads of publishers who permit their newspapers to take from syndicated columnists libelous and half-baked abuse which they would not print if it were written by their own reporters. insist that news and opinion regarding the acts of public men or private citizens for that matter, be held to ordinary standards of accuracy, fairness and decency.